ITIL is the most widely accepted approach to IT service management in the world which help individuals and organizations use IT to realize business change, transformation and growth. It describes a framework of processes, activities, organization and roles to form a lifecycle approach to IT service management. 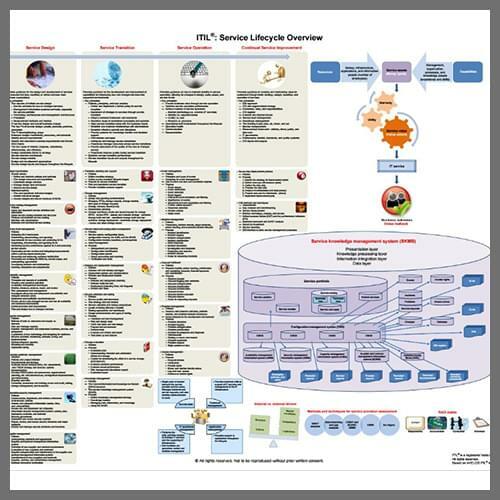 To learn more about the five phases of the ITIL 3 Service Lifecyle and the purpose and processes within each phase of the service lifecycle, submit the form to download our complimentary ITIL Service Lifecycle Overview Chart. Access Your Free Resource Today! Complete and submit the form below to access this content.